You can add page numbering objects in Document Composer by using text elements in the Page Master. Page numbers are applied to the entire document. You may position these page numbering objects anywhere on the Page Master and style them just like any other text element in Document Composer. Note: Page Numbering can only be added to the Page Master. From Document Composer, select Add Page Master Layout from the Insert menu. Select this option from the New Page Layout button from the Positioning toolbar. The Page Master appears in the Design View. Add elements and set properties for the elements in the Design View. Note: Only text, images, and lines can be added to the Page Master. Add a page numbering object to the Page Master. Select Text from the Insert menu. Select the text button on the Components toolbar. Click and drag the crosshair on the Page Master to create the page numbering object, and adjust it to the size you want. Note: Page numbering objects can have accompanying text and they can be positioned anywhere in the Page Master. Double-click, or highlight and single-click, the page numbering object to go into edit mode. Right-click the page numbering object, select Insert, and select a page numbering option from the context menu. The page numbering object is added to the Page Master. The following image shows the page numbering options available from a page numbering object in the Page Master. Adds the <Page #> object, representing the current page number of the document. Adds the <Total pages> object, representing the total number of pages in the document. Adds the <Page # of ##> object, representing the current page number of the total number of pages in the document. Note: THE HH.MM.SS format is a time format. The time is updated dynamically to display the current time at run time. Within a coordinated compound report, you may select whether page numbers are reset at each new coordinated sort key value or run continuously through the entire document. The Reset Page Number option enables the coordinated compound layout to be used to create single continuous reports across sort values, or to burst into individual reports by the primary sort key, and retain the desired page numbers. Note: The Reset Page Number option is only available when the Coordinate report property is set to On. Ensure that a page numbering object exists in the Page Master. From the Properties window in Document Composer, select Compound document from the Properties list. Select On from the Coordinate report properties field. The Reset Page Number option appears in the Properties window. Select On or Off from the Reset Page Number properties field. Reset Page Number affects both the individual page number and the total pages within each document. On resets page numbers to 1 at each new value of the primary coordinated sort key. With On selected, total pages is set to the page count for the current value of the coordinated sort key. Off enables page numbers to run continuously through the document. With Off selected, total pages is set to the actual total page count within the overall document. 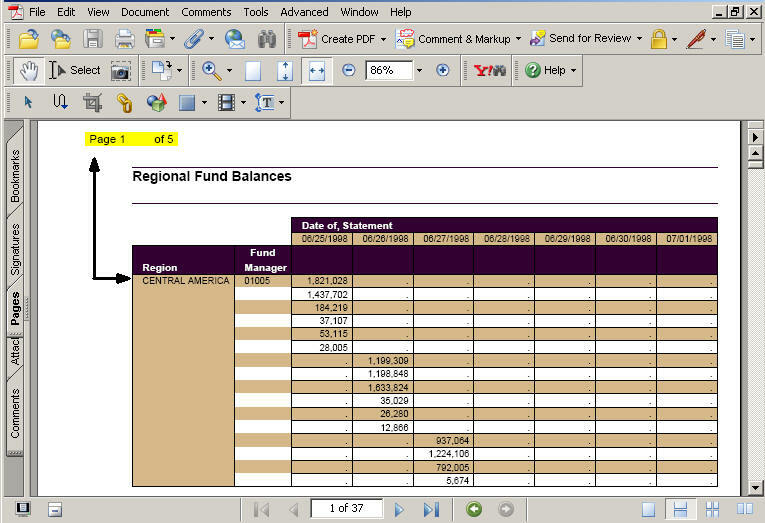 Note: Page numbering in the Table of Contents is not affected by the Reset Page Numbers selections, and displays the actual page numbers within the overall document. For more information about the Table of Contents, see Adding a Table of Contents Page. Save and run the document. The output generates separate page layouts by the common sort field. 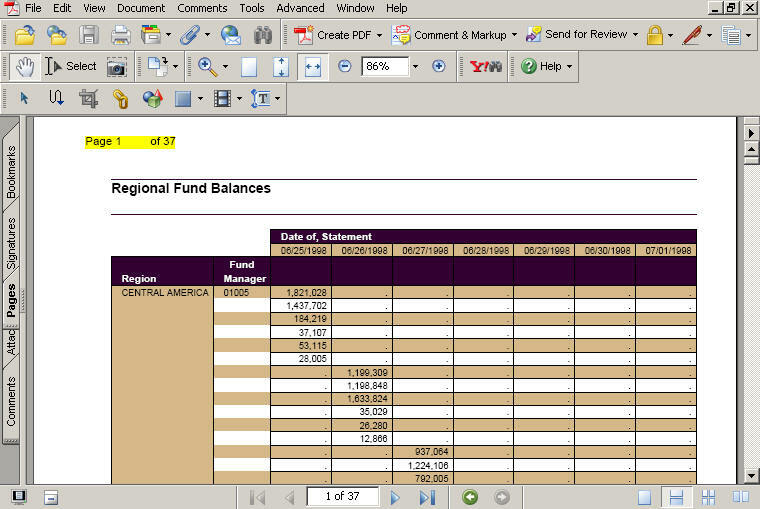 In the example below, Reset Page Numbers is set to On, showing Pages 1 of 5 as the page number and total page number for the first sort field, where the Region is Central America. 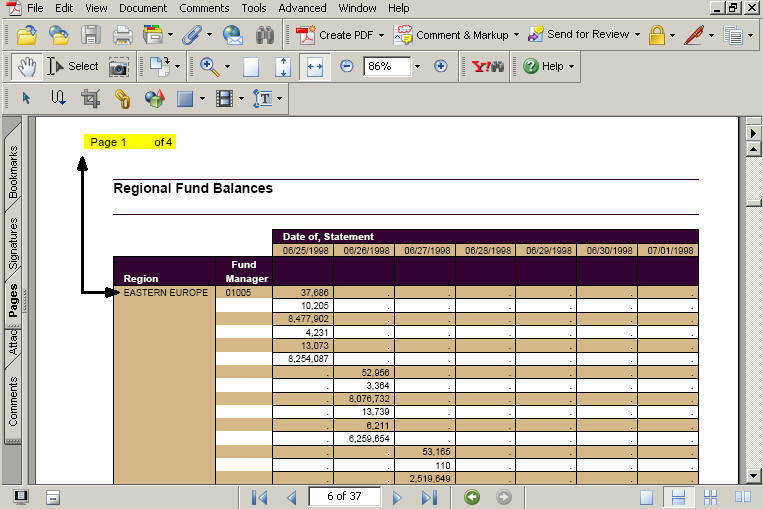 When the primary sort value (Region) changes to Eastern Europe, the page number resets to 1 (Page 1 of 4). 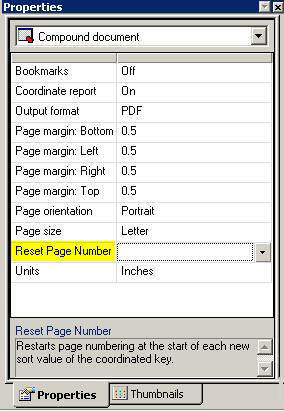 In the same example below, Reset Page Numbers is set to Off, as indicated by the page numbers (Page 1 of 37) that run continuously across all sort values through the document. When selecting images from Document Composer, images must be stored in a location on the application path of the WebFOCUS Reporting Server. Images stored in any other location outside of the WebFOCUS Reporting Server application path will produce errors at run time. Note: If you specify an application path at the Managed Reporting report or Domain level, using the Managed Reporting Properties option, Document Composer copies image files to the application directory. If no application path is specified in the Managed Reporting Properties for the report or domain, copy the image file to an application directory that is on the application path of the WebFOCUS Reporting Server.